11.24.030 Allowable commercial industrial uses. 11.24.040 Regional commercial (RC) zone. 11.24.050 Light industrial (LI) zone. 11.24.060 Light and heavy manufacturing (M2 and M3) zones. A. Purpose and Intent. The purpose of this chapter is to specify the requirements and development standards within the commercial industrial zones, as established by the zoning map. Commercial industrial zones provide areas suitable for the operation and protection of a range of larger-scale commercial and industrial businesses and processes, and minimize the impacts and noise of nonresidential uses on adjacent residential neighborhoods. B. Character. Commercial industrial zones are characterized by buildings and layouts suitable to the business needs of the community for the operation of commerce and light and heavy industrial activities. Regulations, development standards, and site planning standards of this chapter regulate the commercial industrial zones for this purpose. The building, design, and development standards of this chapter shall be applicable to all buildings and uses within the commercial industrial zones. Medium- and large-scale commercial uses and industrial/manufacturing uses are intended to be the primary permitted uses in all commercial industrial zones. Commercial industrial zones include regional commercial (RC), light industrial (LI), light manufacturing (M2), and heavy manufacturing (M3) zones. The specific design and development standards for each zone are detailed within this chapter. Allowable uses in the commercial industrial zones, as identified by Table 11.21-4, Commercial Industrial Zones Allowed Land Uses, shall be for the express purpose of establishing districts to conduct medium- and large-scale commerce and industrial/manufacturing activities, and to limit the impacts and nuisance on residential uses and other nonresidential uses. 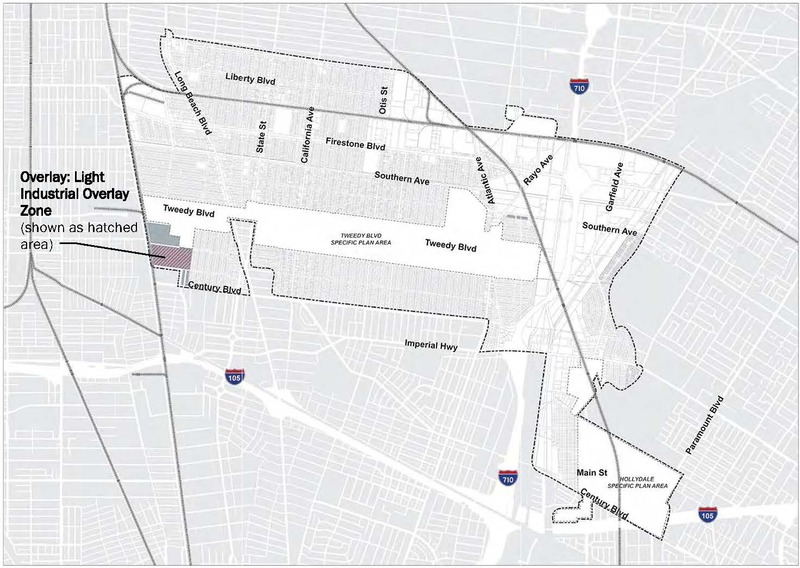 The regional commercial (RC) zone is intended to provide for retail and service-oriented uses in a setting that is suitable for large, regional-serving commercial development and to attract patrons from South Gate and the greater region (Figure 11.24-1). This zone is intended to foster a supportive climate for retail and service commercial uses. The RC zone is intended to implement, and is consistent with, the single-use retail place type designation of the general plan. A. Development Standards. Table 11.24-1, RC Development Standards, and the design standards of this section shall regulate all uses and structures within the RC zone. Figure 11.24-2, RC Zone Development Standards, illustrates the development standards of Table 11.24-1. B. RC Zone Use Limitations. 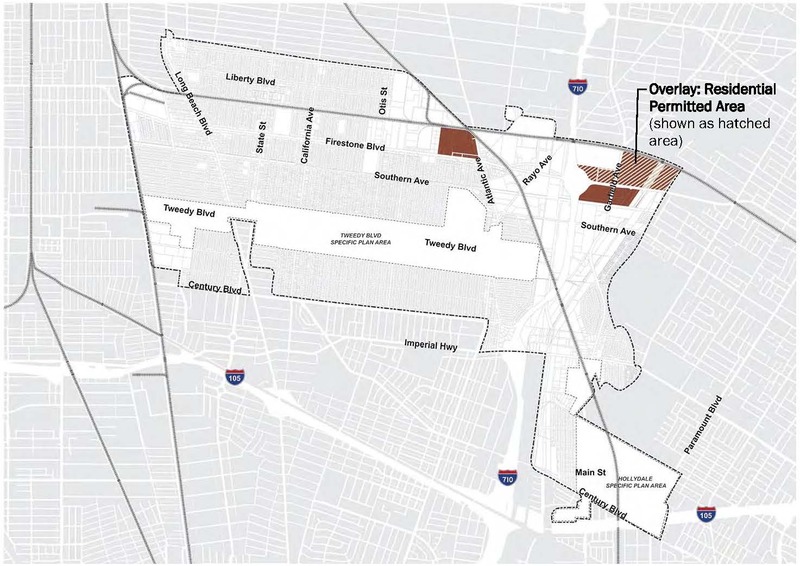 New single-use retail buildings, vehicle fueling stations, and drive-through restaurants are permitted in the RC zone area north of Firestone Boulevard or east of Bowers Avenue. C. RC Zone Operational Standards. The following standards shall apply to all uses and activities within the RC zone. 1. Indoor Land Uses. Unless otherwise noted in Table 11.21-4, Commercial Industrial Zones Allowed Land Uses, or allowed by a temporary use permit, all land uses in the RC zone shall be conducted completely within an enclosed building. 2. Storage. Storage shall be limited to accessory storage of commodities sold at retail or supplies used in connection with the permitted land use on site. Landscape screening shall be provided between the site wall and the primary street frontage. 1. See Section 11.30.030, Administrative modifications, for permitted setback modifications. See Section 11.30.050(E) for buffer setback requirements between residential and industrial uses. 2. All site walls shall be solid walls with landscaping street screens; see “solid wall” definition in Chapter 11.60, Definitions. 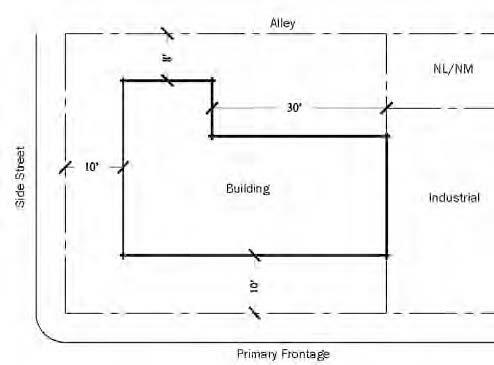 Interior walls may be permitted up to eight feet maximum when adjacent to commercial, industrial, open space utilities, alleys or parking lots. Barbed wire is prohibited. 3. See Figure 11.24-2 for a diagram of this standard. Applicable to All: All standards are minimums unless otherwise noted; setbacks shall be measured from property line. PL = property line; NL = neighborhood low; NM = neighborhood medium. 1. Residential Permitted Areas. 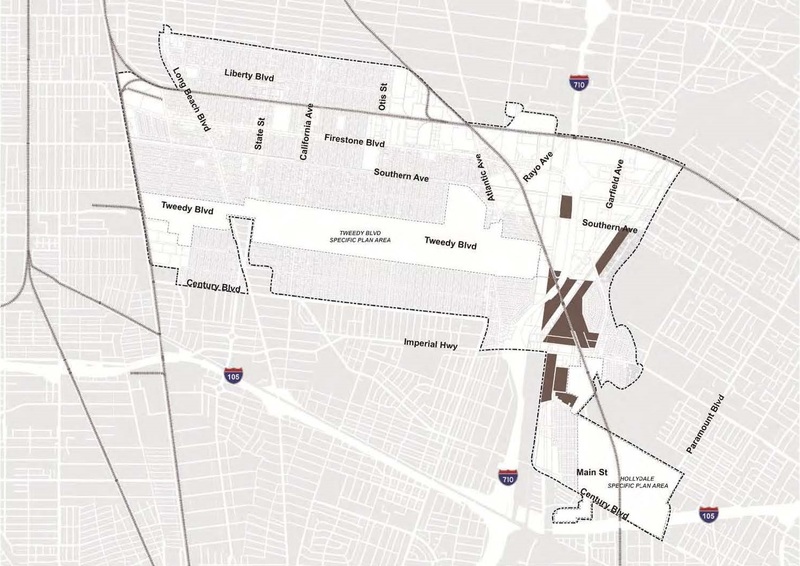 Residential units as part of mixed-use projects are permitted only in the residential permitted areas of the RC zone as shown on the zoning map for the RC zone located north of Firestone Boulevard and east of Garfield Avenue. Residential units shall be regulated consistent with Chapter 11.23, Development and Design Standards and Guidelines, and Section 11.25.080, Multifamily development standards. 2. Corridor Transition Overlay. See Chapter 11.26, Corridor Transition Overlay, for overlay details. The light industrial (LI) zone is intended to provide for a variety of industrial, office, and retail uses in a campus-like setting (Figure 11.24-3). This zone is intended to incubate and allow expansion of boutique industrial development. The LI zone is intended to implement, and is consistent with, the light industrial/flex place type designation of the general plan. A. Development Standards. Table 11.24-2, LI Development Standards, and the design standards of this section shall regulate all uses and structures within the LI zone. Figure 11.24-4 illustrates the development standards of Table 11.24-2. B. Special Restrictions and Applicable Overlay. 1. See Chapter 11.26, Corridor Transition Overlay, for overlay details. 1. See Section 11.30.030, Administrative modifications, for permitted setback modifications, including building height. See Section 11.30.050(E) for buffer setback requirements between residential and industrial uses. 2. 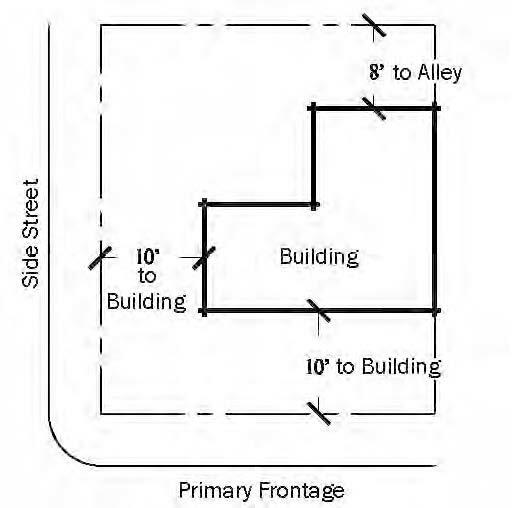 A NL/NM adjacent PL is any property line directly shared with/adjacent to a NL/NM zoned property or separated from a NL/NM zoned property by a public street or alley. 3. All site walls shall be solid walls with landscaping street screens; see “solid wall” definition in Chapter 11.60, Definitions. Interior walls may be permitted up to eight feet maximum when adjacent to commercial, industrial, open space utilities, alleys or parking lots. Barbed wire is prohibited. 4. Additional fence height may be permitted for security fencing (see Section 11.30.070, Security fencing), or additional screening (see Section 11.44.110, Industrial collections and processing facility). 5. See Figure 11.24-4 for graphic representation of this standard. The light and heavy manufacturing (M2 and M3) zones are intended to implement the manufacturing/distribution place type designation of the general plan (Figures 11.24-6 and 11.24-7). This zone includes uses such as industrial, manufacturing, large-scale warehouse, distribution, or logistics facilities. A. Development Standards. Table 11.24-3, M2 and M3 Development Standards, and the design standards of this section shall regulate all uses and structures within the M2 and M3 zones. Figure 11.24-5 illustrates the development standards of Table 11.24-3. B. Building Frontage. New buildings should be allowed to take advantage of the frontage and visibility from Interstate 710 (I-710). C. Special Restrictions and Applicable Overlay. 1. 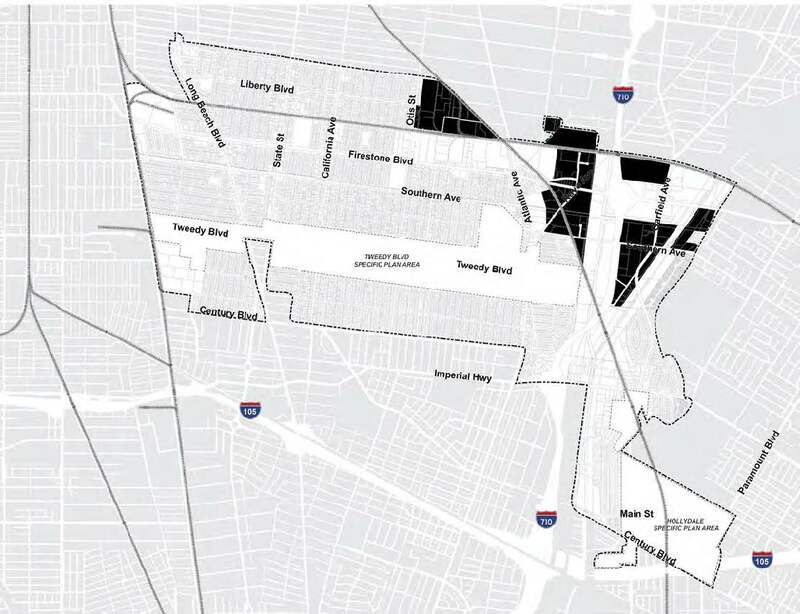 Single-use retail is envisioned in the M2 and M3 zones generally located between the Los Angeles River and the Rio Hondo River, south of the Firestone Boulevard and I-710 interchange, and the M3 zoned land east of the Rio Hondo River and west of the existing multifamily development on Karmont Avenue. 2. See Chapter 11.26, Corridor Transition Overlay, for overlay details. 4. Additional fence height may be permitted for security fencing (see Section 11.30.070, Security fencing), or additional screening (see Section 11.44.110, Industrial collections and processing facility, and subsection (L)(3) of this section, Fabrication/Welding). 5. See Figure 11.24-5 for graphic representation of this standard. D. Light Manufacturing Zone. The light manufacturing (M2) zone is intended to provide for a range of industrial and manufacturing activities, serving as a transitional zone between the most intensive industrial uses and other land use activities. The M2 zone is intended to implement, and is consistent with, the manufacturing/distribution place type designation of the general plan. E. Heavy Manufacturing Zone. The heavy manufacturing (M3) zone is intended to provide a setting for the most intensive industrial and manufacturing activities, providing an employment and export base for the community. Heavy industrial activities are intended to be the primary land use in this zone, and should be designed to protect the productivity of the industrial activities and minimize impacts on surrounding uses. The M3 zone is intended to implement, and is consistent with, the manufacturing/distribution place type designation of the general plan. G. Manufacturing/Industrial Operational Standards. The standards of this section shall apply to all land uses in the LI, M2, and M3 zones. 1. Vibrations. Vibration produced from the operation of machinery shall not exceed a displacement of 0.003 inches, as measured at or beyond the site property line for any adjacent non-M2 and M3 zones. 2. Lot Surface. All nonenclosed areas of a lot used for the movement or storage of vehicles, equipment, merchandise display, or outdoor land use activities shall be surfaced and maintained consistent with specifications for parking lots in Chapter 11.33, Parking Standards. 3. Refuse and Recycling Area Required. Areas for storage and collection of refuge and recycling are established by the development standards table of the applicable zone, or as otherwise recommended by the waste management company. See Chapter 11.44, Recycling and Refuse Facilities, for additional requirements. i. The pedestrian way, including areas along primary or side streets. ii. Pedestrian paths, including mid-block connections, from parking lot areas to the building or street. 1. On-Site Management. A manager or employee shall be on the site during all business hours. 2. Security. A centrally monitored electronic security system, approved by the South Gate police department, shall be used at all times. i. A check-in and check-out procedure shall be instituted, requiring, among other things, that each visitor to the facility provide his/her name, address, driver’s license or other legal identification number, vehicle license, storage area visited, and time in and out. ii. The manager and any person employed at the facility shall be subject to a police record check. 3. Storage Areas. Commercial deadbolt locks shall be installed for each storage area. i. For any storage space doors that open outward, the hinge pin shall be installed in such a manner that it cannot be removed. ii. An alarm switchboard/indicator shall be installed in the office to indicate when a storage area is opened. 4. Lighting. Sufficient lighting, including roof lighting, shall be maintained to facilitate visual observation of the site and storage area during the hours of darkness. 5. Hazardous Materials. No toxic or flammable material storage shall be permitted on premises; this requirement shall be conspicuously posted in each storage area. 6. Mandatory Reporting. Reporting of all crime and burglary to the management shall be a rental agreement condition, and the report shall be available to all tenants and the South Gate police department. 7. Police Cost Reimbursement. The use operator shall reimburse the city for any on-site safety enforcement costs incurred by the South Gate police department. 8. Caretaker Unit. One caretaker/manager’s unit may be permitted on the site, subject to single-family development standards and size, including the required off-street parking. 9. Each storage space may have a minimum of nine feet by twenty feet immediately adjacent loading space with ingress and egress; said loading space is in addition to any and all driveways. K. Freight Classification Yards. This land use shall be limited to the locations permitted as of January 1, 2005. Any additional construction or use to those locations shall require a CUP and a discretionary plan review by the planning commission. As a part of the environmental analysis for this process, at a minimum an air quality analysis, a fiscal analysis, and a traffic study will be required. 3. Completely screened by an eight-foot-tall solid wall along any adjacent neighborhood low/neighborhood medium zone property line, or the property line closest to the neighborhood low/neighborhood medium zone lot. Trees/shrubbery shall be planted and maintained to the satisfaction of the city engineer.